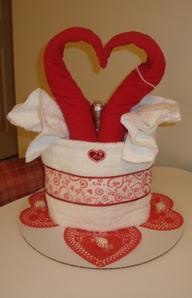 Why make a towel cake? 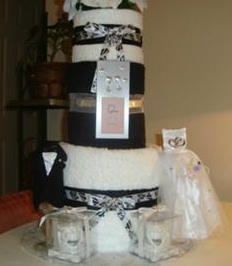 For years the towel cake has impressed brides and grooms around the world. It has been seen at weddings and wedding showers. Well, I think it is high time that it is used for babies! It is just as beautiful as a diaper cake, but easier and faster to make than its diaper counterpart. It is calorie and fat free! Not only can you create a beautiful cake, you can stick to your diet at the same time! 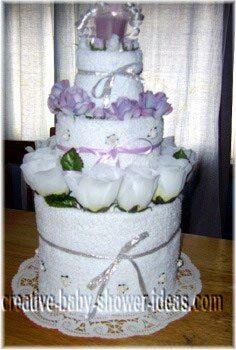 If you can fold a towel and roll a towel, chances are that you will excel beautifully at making the towel cake. 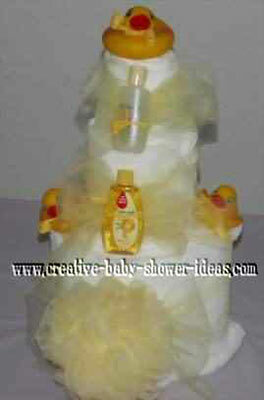 It provides useful items to enhance the baby's bath time . 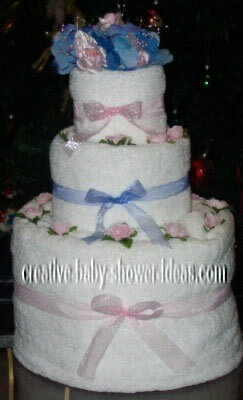 On this page, you can get instructions on making a towel cake and view a great picture gallery. Start with the regular sized towels. Fold them in half twice lengthwise. At this point, you have a choice of laying one towel on top of each other or end to end. Roll from one end to another end in a tight roll. If you are rolling end to end, you will need to attach the towels with a safety pin or overlap slightly. The tighter the towel roll, the better. This roll will form the bottom layer of your cake. You can hold it together with a safety pin and a tie decorative ribbon around the middle of the towel roll. The second layer will consist of the 2 hand towels. Fold and roll the hand towels in the same fashion as the bottom layer. Add the ribbon and place on the bottom roll. One more layer to go! Roll the 2 washcloths in the same fashion. 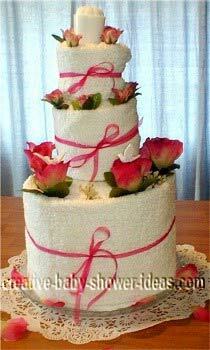 Add the decorative ribbon and place on top of the cake. 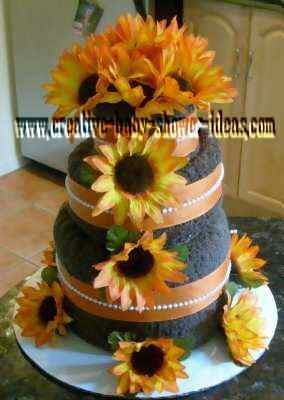 Use a cake stand or circular base to hold the weight of the cake. Start with the base layer and stack the other layers on top. Make sure each layer is centered on the layer beneath it. 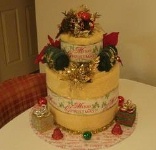 This will give you a visual idea of how much room you have for adding your decorations to the cake. If you would like additional support a dowel may be cut to the height of the towel cake and inserted in the middle. Choose your theme. 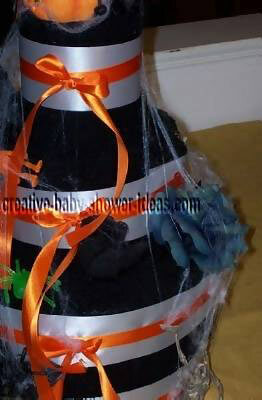 Most likely the theme will be centered along with bath time. But you still have a lot of flexibility to twist the theme into any direction you would like. Your theme can be focused on color, gender, baby shower theme, pampering mom, education, baby items, characters and so forth. Choose ingredients that compliment your theme. Don't forget the most important and fat free part of cake. The top of the cake is the centerpiece of the cake. Ask yourself what item will create the final bling effect? This is where the eye will be focused. 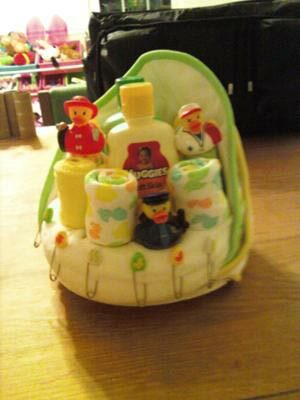 You can put a rubber ducky, bath sponge, flowers, bath toy, big bow, baby shampoos or cleansers, etc. Keep in mind that the top layer of the cake will be very small. 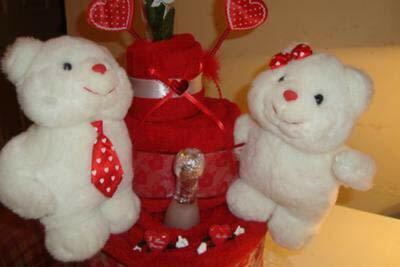 A large stuffed animal or toy might not fit on top of the cake. It is best to get smaller items that fit well with your overall theme. 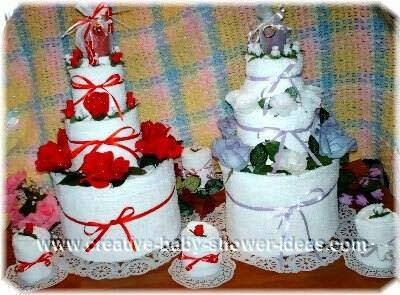 I have also seen a lot of wedding towel cakes sprinkled with fake rose petals to give the final effect. 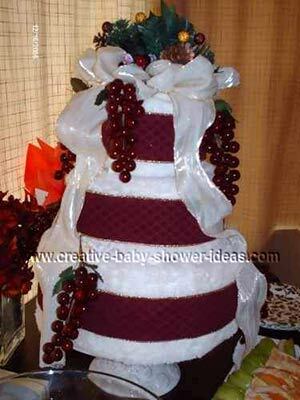 The same can be done with a baby towel cake. Add flowers, pearls, decorative tulle or lace to give that creative touch! 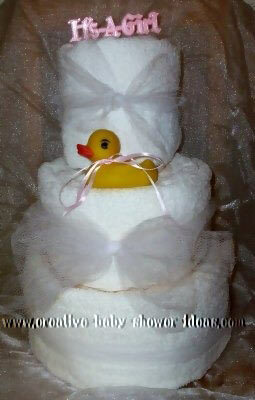 To see step by step instructions with pictures, visit How to make a towel cake! 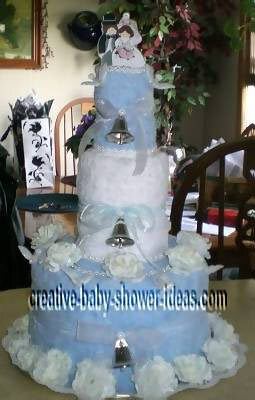 I specialize in towel cakes for weddings but every once in a while I do baby towel cakes. 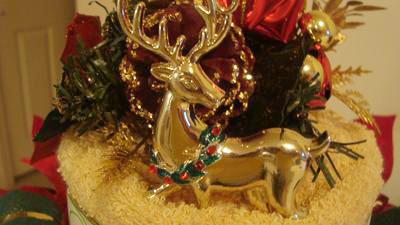 My website www.candlesandmore.com features a collection of candles and gifts. 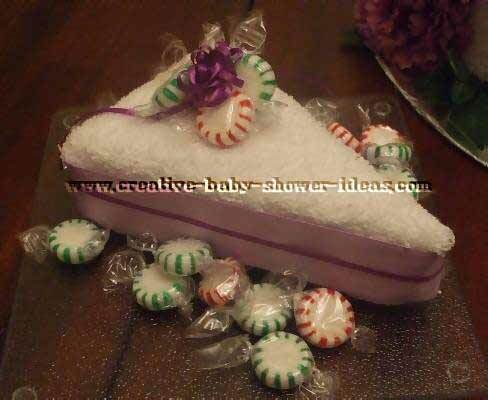 Here is a lavender towel cake I made. It has lavender and white silk flowers on it. I topped it off with a cute lavender candle. I wanted to share my first baby blanket cake with you. It was so much fun to make. I used a big baby bottle for the center to hold the whole cake together. I also hid more gifts inside it. It was a big hit. Thanks for the help, I hope you like the cake I made. 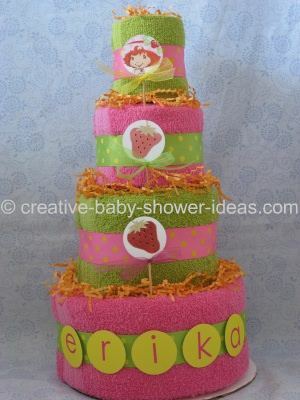 Here is a baby towel cake I made with a peach and pink theme. 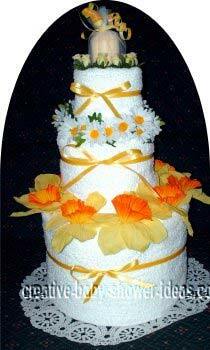 I used a white candle on top and placed the cake on a lace doily. 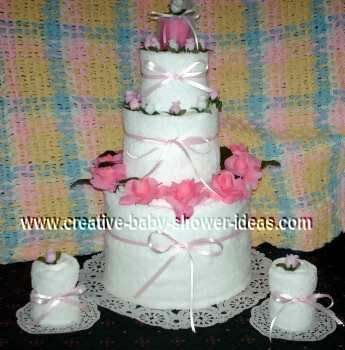 I accented it with pink and peach flowers, baby's breath and a small dove figurine. I made this cake for my sister in law's baby shower. The inspiration of the tutu outfit came from the cute shirt I found. I tied the middle layer with pink tulle. 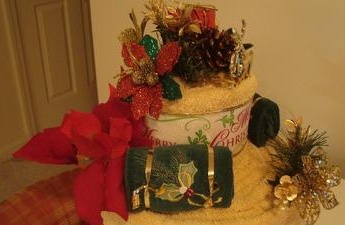 The top layer I tied a ribbon around and placed a washcloth on top to make it look like a hat. The bottom layer I hot glued pink tulle to a decorative ribbon. 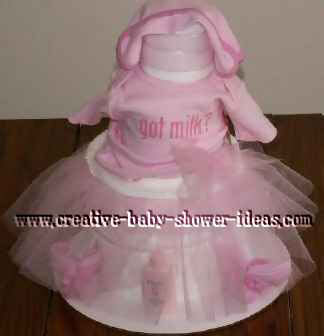 I made pink washcloth bunnies and placed trial size baby products under the skirt. 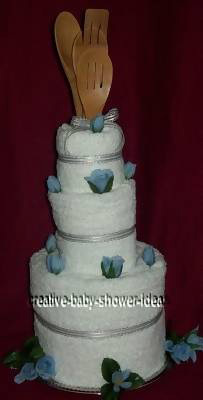 This towel cake was decorated with white and blue silk roses. 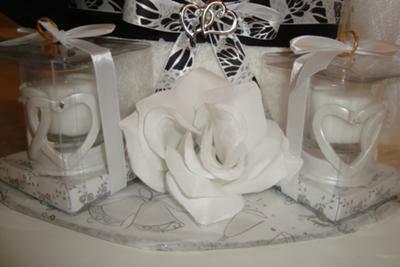 I used tiny rosebuds on top and a wrapped white candle. This cake was done with the patriotic colors of red white and blue. 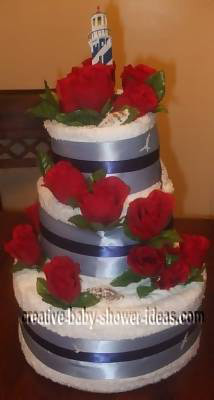 I placed red and white silk roses on a white towel cake. I then tied it off with navy blue ribbons. I accented it with cute rose stickers. 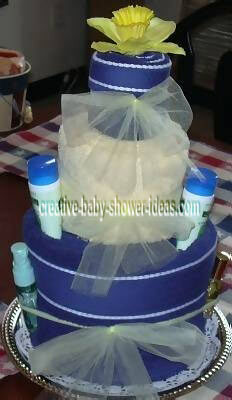 I made this towel cake for a friend's baby shower. 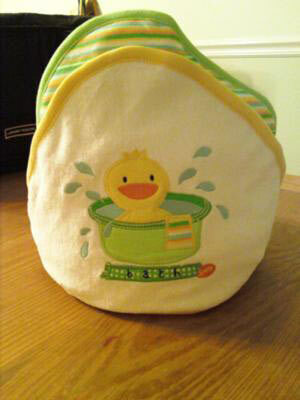 I started out with the cute rubber ducky bath set. I used yellow tulle to tie each layer together. Then I placed trial size bath items at the center of each bow. I thought a bath sponge would be really cute to be used as a flower for the base layer. This towel cake was decorated with soft baby colors. 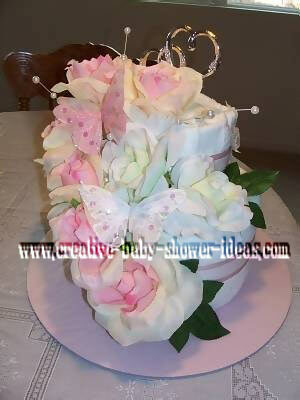 I used pink, blue, white, lavender and cream colored flowers and ribbons on the cake. I tied tiny pacifiers on the cake and added a cute heart sticker on the bottom layer. A white candle tops it off. 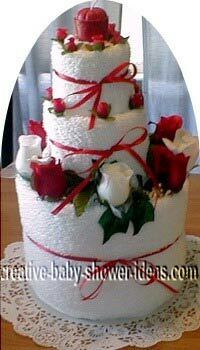 This cake has red and white silk flowers on it. I used both large and tiny rosebuds to give it interest. I tied a red ribbon on each layer and topped it off with a red candle. 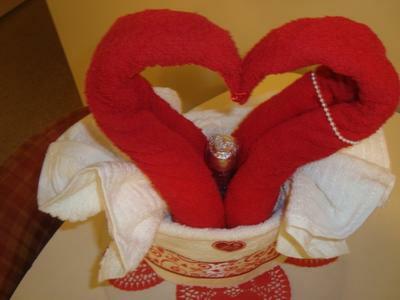 This fun towel cake was made by rolling 3 layers of white towels. I accented it with different kinds of yellow silk flowers. To finish it off, I tied yellow ribbons and added a yellow candle on top. 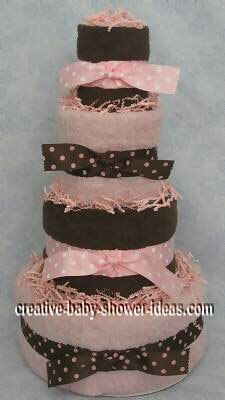 This towel cake was made "all girl" complete with pink towels! 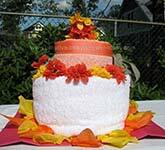 I used a variety of white flowers to accent the cake. I placed a pink candle on top and used some fun stickers on the bottom layer. 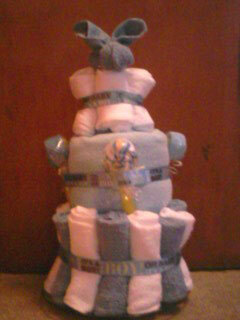 I made this towel cake for my sister's friend. I used 1 bath towel, 2 hand towels, and 2 wash cloths. Here is a picture of some cakes I made. Both were made with white towels. I accented one with red colors and the other with lavender. 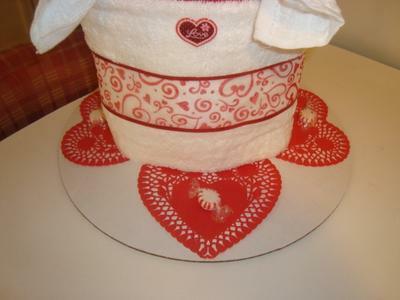 I used single washcloths to make matching cupcakes and displayed all cakes on lace doilies. 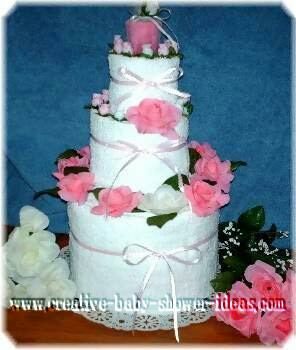 This towel cake has been decorated with pink and white silk flowers. 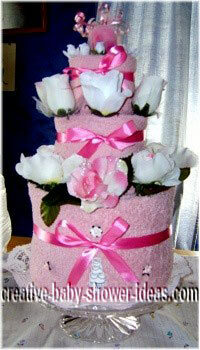 I placed tiny rosebuds on the top layer and accented it with pink ribbons. I finished it off with a pink candle on top. I made this cake with pink towels. 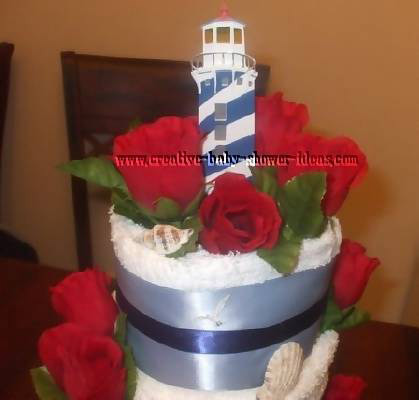 I used red, pink, and white roses around the layers. I tied a cute Congratulations ribbon on top. I finished it off with a candle and lots of curling ribbon. I used white towels to make the layers of this cake. 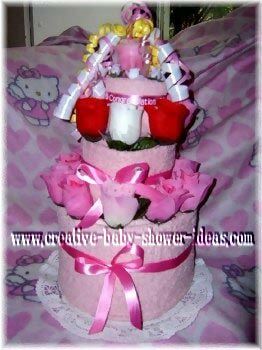 It was accented with pink flowers, ribbon and a pink candle on top. I rolled single washcloth cupcakes to match. 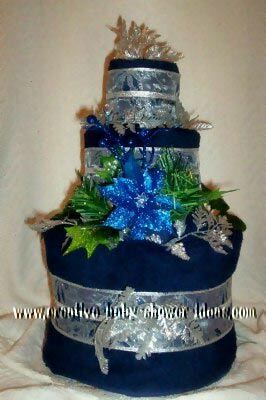 This cake is a great gift for any occasion, it has: 2 body towels, 2 hand towels, 2 face towels, a blue poinsettia, and silver solid and sheer ribbon. 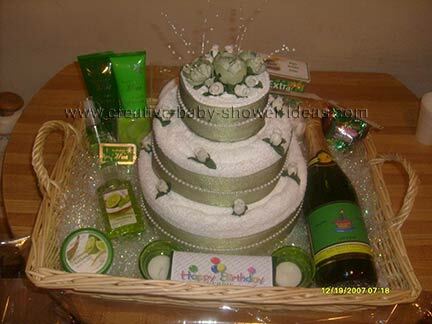 For more information on this beautiful Bridal Shower Cake, please contact us at diapergifts@yahoo.com. Thank you so much for letting me share these, I just love doing crafts. 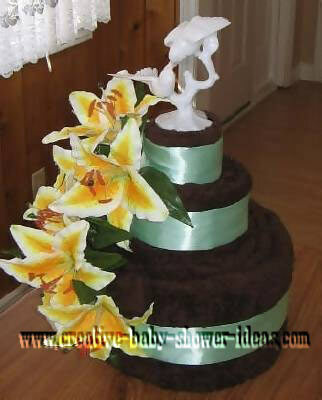 I do this just for fun, the poodle cake was for my first grandchild and I had the best time doing it. I saw your site about sharing pictures. I know how much I love looking at what other people do and the wonderful things other crafter's share. 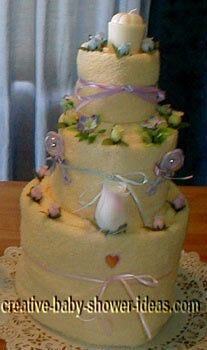 Here is a wedding Shower cake with touches of purple. This is my first cake in a bright fuchsia & lime Strawberry Shortcake theme. 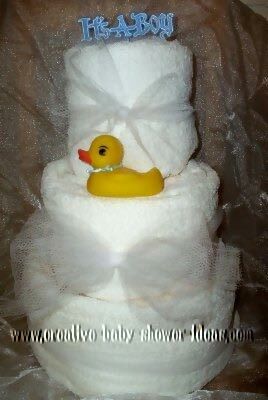 My first towel cake was made for our best friend's wedding. 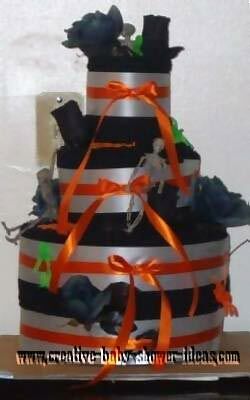 They had a Halloween wedding. Cake consists of: 2 bath towels, 2 hand towels, and 2 wash cloths, many Halloween decorations and center is filled with candy rockets. Everyone thought it was great. Made a great centerpiece for the table at the after party. Hope to make more in the future. It was so much fun! I made this cake for my cousin's wedding shower. I used two bath towels, two hand towels, two washcloths, and a five piece bamboo kitchen set. The fifth utensil is in the middle of the cake, offering stability. I used a silver serving tray instead of a cake board for the bottom. 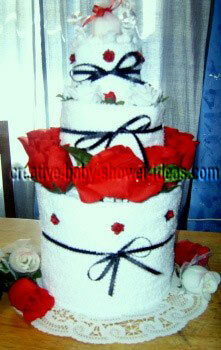 This is my 2nd towel cake. It is for a bridal shower. I used: 2 bath towels, 3 hand towels, and 4 wash cloths. 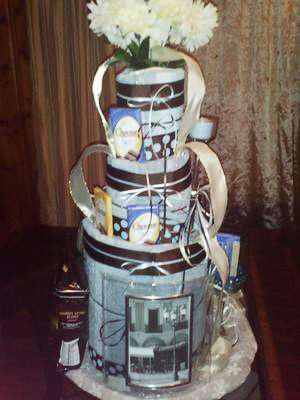 Cake is filled with bath stuff and candles and mints for the bride to be. 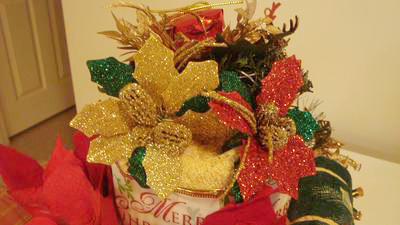 Butterflies, ribbon and flowers to decorate. 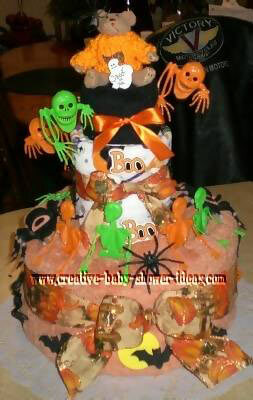 This one I've included a "slice" of cake, which is also filled with candles and mints. Had a lot of fun making this one, went a lot smoother as it's my 2nd one. The card says: So you can "dry off" after your "shower". 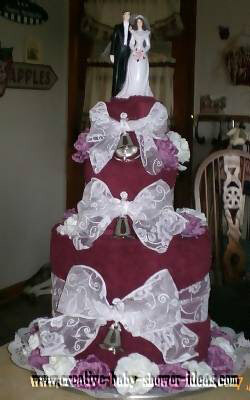 This was my second towel cake, in a Pink & Cappuccino bridal shower theme. 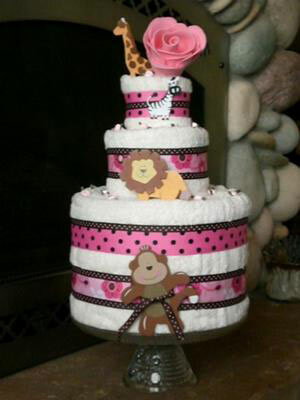 I made this cake for baby girl with a zoo theme. 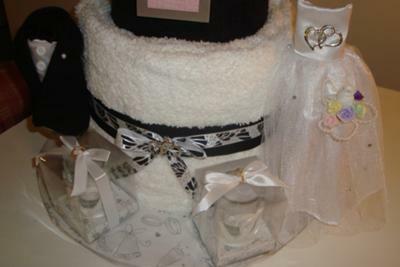 I used two cream colored bath towels, two hand towels, two wash cloths, ribbon, zoo characters from Michael's already painted, rosettes, and a large pink rose on top that is a bath sponge! 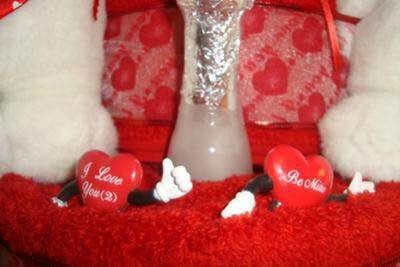 My Mom got me started making these beautiful centerpieces. 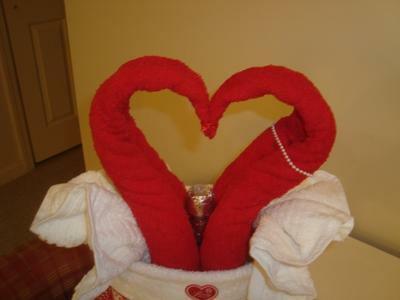 I use 2 Bath Towels, 2 Hand Towels and 2 Wash Clothes w/ decorations. 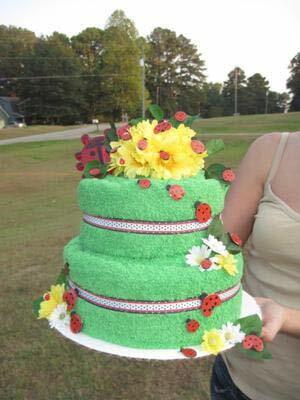 This Lady Bug Towel Cake was a special order for a girl who just loves, loves, loves lady bugs. 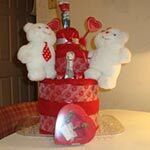 Now she is displaying it as an everyday centerpiece in her kitchen. I made this bunny cake with ribbon, 14 regular washcloths, 1 small towel, 1 infant fleece blanket, and 5 onesies. 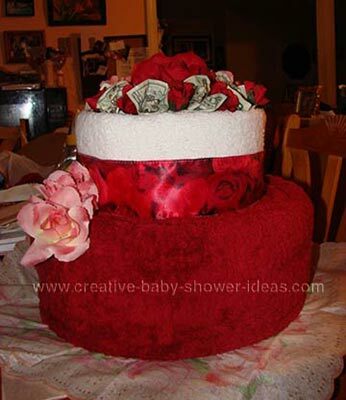 The bottom layer is made of 14 washcloths and one towel. the center layer is a blanket and the top is the onesies. To top it we made a boo-boo bunny. There are four washcloth lollipops around the center layer. 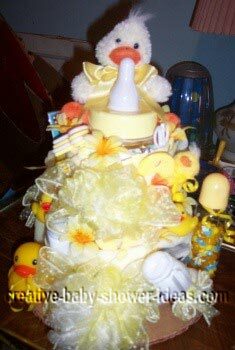 For my friends baby shower gift, I created a single layered towel cupcake that was made up of a towel, wash cloths, body wash, rubber duckies and cloth diaper pins. I rolled the towel up jelly roll style and then wrapped it around the baby wash. 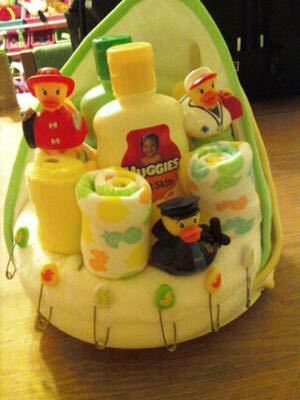 The baby's dad is a policeman so I bought little rubber duckies that had police and firemen and double sided taped them to the towel cupcake. 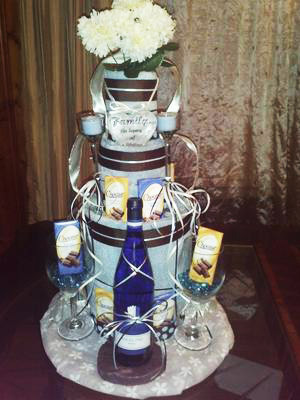 Wine down the night of your wedding with this 3-tier wedding towel cake. 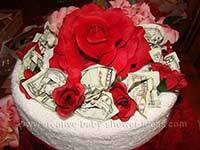 This cake was purchased from me as a wedding gift. A co-worker purchased this gift for the bride and groom. 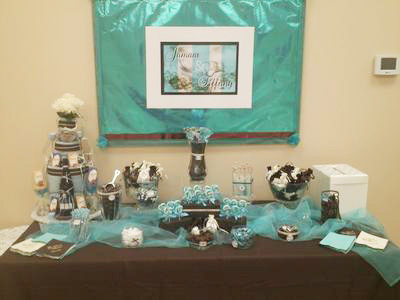 The brides name is Tiffany, so the theme was Tiffany Blue's Chocolate Factory with Creme on Top.